A North American native tree, River Birch is one of the most graceful trees for the landscape. Beautifully grown as a single specimen or a birch tree grove. Grown in groves, the fast growing river birch is an excellent firewood source. 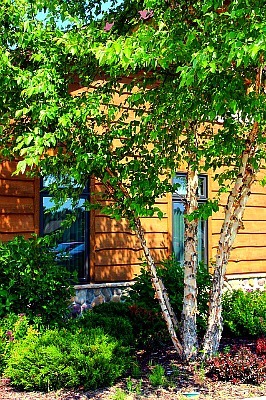 Once established the Heritage Birch is drought tolerant, yet is easily adaptable to wet soil areas. Reaching 40 to 60 feet tall, this weeping shaped tree, is often seen growing in clumps of 3 trees. An excellent northern tree variety that is tolerable of road salt. Beautiful peeling bark. Heritage River Birch is growing in a gallon container. Orders shipping to AZ and CA will be bare rooted before being prepped for shipping.